In 2013, Southern A & E was charged with renovating Morrow High Schools aging technological infrastructure. 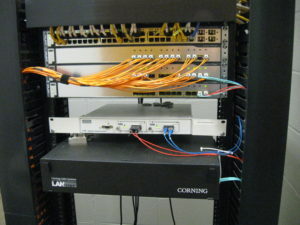 The schools existing data network cabling system was installed long after the buildings were built. Data frames were located in janitor’s closets, storage rooms, and classrooms with minimal clearances, few supports, no standby power and no environmental control (A/C). Entrance facilities for telecommunications, wide area network and cable television were in different parts of the building. First, a wireless network was added to the school. It was installed as a separate, parallel network to the original system. Our electrical engineers noticed that the horizontal and backbone cabling was outdated. We then identified spaces that could be captured or subdivided to serve as the new data closets. Where existing square footage could not be sacrificed, spaces were added to the building to meet the need. The entrance facilities were consolidated to the new main data closet. Standby power circuits were added to each data closet for survival of voice-over IP and intercom system during power outages. Southern A & E’s electrical engineers worked with the Owner to integrate modern technology systems design standards into older buildings by establishing dedicated equipment spaces, then providing adequate power, lighting, climate control, and pathways to support the current and future cabling requirements. In many cases, local power for computers is inadequate and requires additional power systems work. Southern A & E, understands the challenges that school systems face with respect to equipping older buildings with the infrastructure (communications pathways, backbone cabling, cable support systems, and telecommunications equipment rooms) necessary to get the most from their capital investment. With a BICSI certified Registered Communications Distribution Designer (RCDD) as our chief electrical engineer, we stay abreast of evolving technologies.